PRETORIA, South Africa (CNN) -- The president of Athletics South Africa has admitted that he lied about gender tests on runner Caster Semenya before her gold-medal win at the World Athletics Championships last month. Caster Semenya celebrates her gold at the world championships in Berlin. The national sports body has always denied that it agreed to the tests before the race in Berlin, Germany -- an event that kicked off international controversy over the 18-year-old Semenya's gender. But after South Africa's Mail & Guardian newspaper printed e-mails on Friday showing that ASA President Leonard Chuene was aware of the tests, he held a news conference to apologize. "I now realize that it was an error of judgment and I would like to apologize unconditionally," Chuene said on Saturday, according to South Africa's SAPA news agency. After receiving the results of the tests, the South Africa team doctor requested the 18-year-old Semenya be withdrawn from the 800-meter race she ended up winning, Chuene said. But Chuene said he refused to do it because the sport's international governing body did not request withdrawal. He also said withdrawing Semenya might have looked bad. "If we did not let her run, we would be confirming that she is not normal," Chuene told the news conference in the capital, Pretoria. The e-mails printed by the Mail & Guardian are an exchange between team doctor Harold Adams and ASA General Manager Molatelo Malehopo, with Chuene copied in. "After thinking about the current confidential matter I would suggest that we make the following decisions," Adams wrote on August 5, more than a week before the Berlin race. "1. We get a (gynecological) opinion and take it to Berlin. 2. We do nothing and I will handle these issues if they come up in Berlin. Please think and get back to me ASAP." An e-mail response from Malehopo to Adams, sent the same day, says: "I will suggest that you go ahead with the necessary tests that the IAAF might need." The controversy over Semenya erupted after she crushed her rivals in the 800 meters and secured victory in one minute, 55.45 seconds -- the best women's time in the world this year. Semenya's masculine build and dominant performance fueled existing questions about her gender, and the International Association of Athletics Federations -- which oversees the sport worldwide -- ordered tests on her. Reports in two newspapers last week said the results of the tests showed Semenya has both male and female characteristics. The IAAF declined to confirm those reports and said a decision in the case would come in late November. The IAAF said it sought tests on Semenya's gender before the Berlin championships because questions had been raised after her winning performance at the African junior championships in July. South Africans have rallied behind Semenya, angrily dismissing reports about her gender. 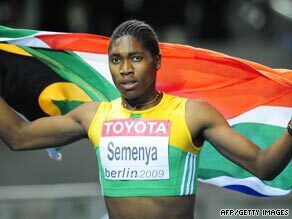 Semenya's relatives and the South Africa team manager have maintained she is female. This week, South Africa's minister for women, children and people with disabilities wrote to the United Nations to complain that Semenya had not been treated in line with international protocols on gender and quality. Noluthando Mayende-Sibiya sent a letter to the U.N. Division for the Advancement of Women, urging it to investigate, SAPA reported. "The questioning of her gender is based on a stereotypic view of the physical features and abilities attributable to women," she wrote in the letter, according to SAPA. "Such stereotypes demonstrate the extent of patriarchy within the world's sporting community." The process of gender verification has undergone big changes since it was first introduced for international competition in the 1960s, the IAAF said. The first mechanism involved "rather crude and perhaps humiliating physical examinations," which soon gave way to mouth swabs to collect chromosomes. There were too many uncertainties with mouth swabs, so the IAAF abandoned them in 1991 and the International Olympic Committee discontinued them in 2000. A proper test has yet to be found, the IAAF said, and the current tests are considered a good interim solution.